Such a survivor resides in the Oyster Bay Historical Society’s Charles Reichman Collection of Nineteenth Century American Tools. It’s a Baumgarten’s Baltimore No. 11 press, with a 2½ x 4 inch platen and two ink rollers. The Baumgarten Company of 45 East Fayette Street in Baltimore, Maryland, began business life in the engraving trade before moving, during the 1890s, into office supplies and small printing presses. The company produced a line of at least a dozen little presses, most of whose designs appear to have been “borrowed” from the Baltimorean line of presses produced by J.F.W. Dorman, also of Baltimore. What were such little presses actually used for? Our Baltimore No. 11’s 2½ x 4 inch platen [the plate which produces an inked impression on paper] would have limited the press’s output to nothing much bigger than a trade card. Even so, it very likely would still have appealed to a professional printer who wished to reserve his bigger presses for larger formats. CR 97.295. Baumgarten’s Baltimore No. 11 press, with 2½ x 4 inch platen and two ink rollers. Charles Reichman Collection, OBHS. Source: Harris, Elizabeth M. Personal Impressions: The Small Printing Press in Nineteenth-Century America. Boston: David R. Godine, 2004. Instrument maker Alexander Megarey made this compass c. 1840. Megarey was born in Ireland in 1790 and served as an apprentice in London before moving to the United States. He ran a small shop in New York City where he manufactured surveying instruments from 1825 until his death in 1850. William J. Youngs (1819-1875), the owner of the compass, was born in Oyster Bay and attended school at Marmaduke Earle's Oyster Bay Academy, where in 1833 it is believed that he drew a map of Oyster Bay (a copy of which is now in the Society's Map Collection). Youngs certainly used the compass in surveying plots in Oyster Bay. His name is scrawled on the inside lid of the instrument's wooden case. Office of Commissary General, Daniel Wier. Forage Requisition. New-York : Printed by H. Gaine, 1777. Supplying the British Army garrison in New York and on Long Island was a monumental task. The British established supply depots, or magazines, at several points on Long Island to gather food for men and horses, firewood, and straw for bedding. This broadside notified the people of Long Island where these magazines were located, the prices the British would pay local farmers for their produce, and the mileage allowance for carting their produce to the various magazines. The Commissary General issuing this notice indicated that "it is expected and required that all Persons, who raise Forage, do furnish a certain Quantity..."
The Bird Club of Long Island, First Annual Report, July 1, 1916. Roster of officers and Executive Committee members. The club was organized at Sagamore Hill on 14 May 1915. A year later, there were 448 members listed in the annual report. Annual dues were one dollar. Life members paid twenty dollars. Ellen Curtis, who donated her collection of memorabilia relating to the club, is the granddaughter of Jane Bush Francke, an avid Brookville birder whose correspondence formed the basis of the Society's 2009 exhibition Dearest Jane...Love L.
Oyster Bay Reading Society. Minutes Book, 28 December 1863 to 13 February 1865. Manuscript, 32 leaves, in calf-covered card binding. The Reading Society held its first meeting at the home of Rev E.S. Fairchild of the First Presbyterian Church, its object being "the mutual benefit of its members." Charter members were Oscar Summers, Cornelius B Ludlam, William Minor, Ezra Minor, Joseph Wright, Jacob S White, and James Duryea, all of whom braved hard rain and poor roads to attend. Unlike most 21st-century reading groups, these gentlemen assembled at Rev Fairchild's house to perform dramatic readings from literature. Complimentary promotional booklets, traditionally issued in colorfully printed card-stock wrappers, usually contained a calendar and a block of text promoting the business's products and services. In this case, Johnson Furniture also provided an eight-leaf insert of recipes from the International Cook Book Association, all of which could presumably be prepared on the ranges Johnson sold. Wilbur F. Johnson Furniture and Ranges. East Norwich, New York . 14 cm. Undated advertisements can usually be dated by determining the range of dates during which a business operated from a given location. In this case, McKesson & Robbins, one of the listed purveyors of Green Mountain Oil, conducted business at their Fulton Street address from 1868 to 1880. A method of dating only slightly less precise involves an examination of an advertisement's typography. The extended Antique Tuscan and condensed French Clarendon styles employed for the broadside's display type were popular in the United States from the 1860s through the end of the 19th century. Regents of the University of the State of New York. Academic Diploma. Albany : The University, 1900. 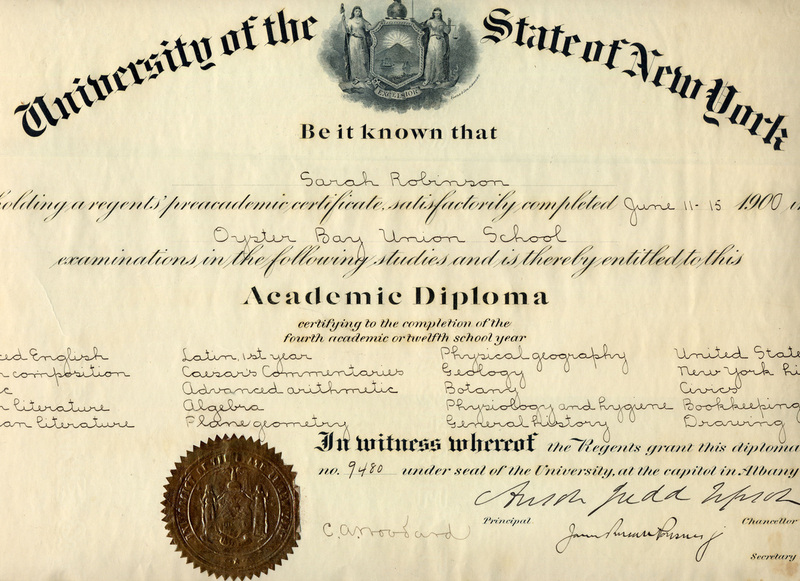 Sarah Robinson was one of four women who comprised the first graduating class of Oyster Bay High School in June 1900. The high school's cornerstone had been laid only the month before in a ceremony featuring New York State Governor Theodore Roosevelt. The fountain at Snouder's Corner Drug Store offered sodas, hot and cold drinks, sundaes, and twelve flavors of Horton's Manhattan ice cream. Originally, the fountain was cooled by block ice, before an electric Frigidaire system took over in 1926. The highest- priced item, a banana split, went for 25 cents and featured a choice of whipped cream or marshmallow. Snouder's listing as Phone No. 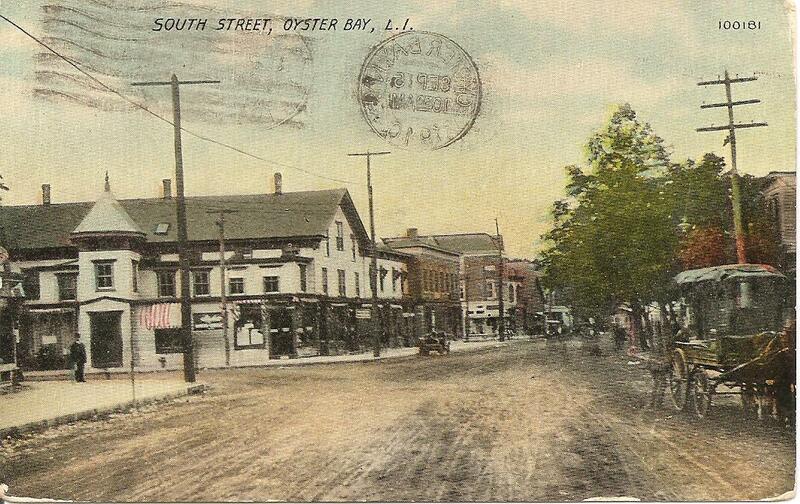 1 reflects the fact that Oyster Bay's first telephone was installed here in 1887, when the business went by the name of Conklin's Drugstore. Abel Miller Conklin, the store's founder, later turned the pharmacy over to his son-in-law, Andrew Snouder, who in turn passed the business on to his son Arthur. Four pages stapled in colored card wrapper. Photocopied typescript text. 8.5 x 5.5 in. Text for the 1982 program appears to have been produced by a selectric-style typewriter capable of offering an array of fonts and emphasis faces. Within a year, the rise of personal computers, digital typesetting, and “desktop” design applications, would begin to rule the production of even the simplest program, flyer, and monthly newsletter.